Personal injury is a general phrase used in law to describe any physical or mental injury to a person caused by another person’s negligent or carless act. For example, if you were injured in a car accident that was caused by a careless driver, then you suffered a personal injury and may file a claim for compensation for the personal injury you suffered. Black’s Law Dictionary defines negligence as the failure to exercise the standard of care that a reasonably prudent person would have exercised in a similar situation; any conduct that falls below the legal standard established to protect others against unreasonable risk of harm, except for conduct that is intentionally, wantonly, or willfully disregardful of others’ rights. In Massachusetts, negligence is a civil cause of action on which a claim or lawsuit may be filed for money damages to compensate the injured party. Negligence is a type of tort, which is a civil wrong that causes another party to suffer harm or loss that imposes legal liability on the person committing the wrongful act. More plainly stated, negligence is an act that breaches a duty owed to others that caused damages. For example: If a person causes a car accident on the Massachusetts Turnpike because he was texting a message on his cell phone, which caused his car to drift into another lane and crash into another car, he will be held negligent. Likewise, if someone slips and falls on snow and ice on another person’s property, the property owner may be held negligent because he failed to remove the snow and/or treat the ice in a reasonable manner and failure created a dangerous condition on his property that caused the other person’s injuries. 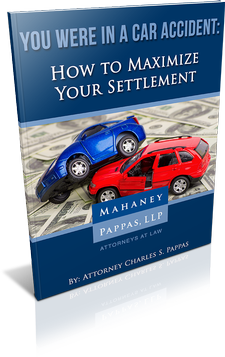 The following is an excerpt from the book written by Attorney Chuck Pappas: You Were in a Car Accident: How to Maximize Your Settlement. In this book, Attorney Pappas explains negligence in detail and outlines the legal elements that must be proven in Court. When people are negligent, it means they have acted or behaved in a careless way that caused injury or harm to another person. Negligence is often the legal theory used in cases involving car accidents. If a driver injures someone because he did not use reasonable care while behind the wheel, the driver is liable for the accident victim’s injuries. There are certain elements that must be established to sustain a claim of negligence. The elements of negligence are: duty, breach of care, causation, and damages. In a negligence claim, the person you claim is responsible for your injuries had a duty to act in a certain way. This is the first element you must establish in your negligence claim. In general, people are required to act in a reasonably prudent manner. In motor vehicle accident cases, establishing the other driver’s duty of care is usually simple. This is because a driver has a legal duty to operate his vehicle on a roadway with reasonable care at all times. Massachusetts has numerous traffic laws that require drivers to do certain things (stop at stop signs) and not to do certain things (not drive above the speed limit). So typically, if a driver violates a traffic law and causes an accident, he is usually deemed to have breached a duty owed to the other party. The second legal element of a negligence claim is “breach of duty.” Once you have established that the other driver owed a duty of care, you must then establish that he breached that duty by failing or neglecting to fulfill that duty of reasonable care. Because drivers in Massachusetts have a duty to operate in a reasonable and cautious manner, if their operation is found to be unreasonable—for example, because of reckless operation, speeding, or not paying attention—you have established that they breached their duty of care. The third legal element of a negligence claim is “causation.” To establish this claim, you must prove that the other driver’s breach of duty was the actual and proximate (direct) cause of your injuries. Before the other driver’s conduct can be considered the proximate cause of your injuries, it must first be a “cause in fact” of the injury. In law school, we learned the test to establish cause in fact was by using the “but for” test: the injuries would not have occurred but for the other driver’s act or omission to act. Therefore, in a Massachusetts car accident case, the injured person must establish that he would not have been injured but for the other driver’s breach of duty. In addition to the other driver being the cause in fact of your injuries, his conduct must also be a proximate cause of the injuries—conduct that is responsible for injuries that were foreseeable. The injured party must show that his injuries were the natural and probable consequences of the other driver’s negligence. The final element that must be established is proving the injured party suffered damages. In a negligence case, the term “damages” means actual harm or injury and includes monetary losses such as medical bills and expenses, lost wages, and property damage. It also includes money for pain and suffering, including mental or emotional distress.